“You want a compliment or the truth?” asked an expert after the launch of another project in the All-Ukrainian School UF Incubator StartUp Week Finals. In fact, experts and potential investors were frank and friendly. 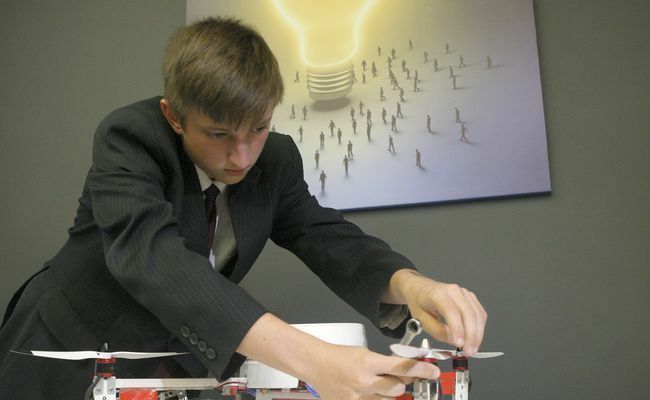 Ten teams of senior high school students had spent a week working on inventions before submitting them to the jury – a board of experts. The event took place at the UNIT.City Park of Innovations in Kyiv. Below are brief interviews with some of the contestants and members of the jury. A total of 27 senior high school students were selected for the first government-run business school known as UF Incubator, based on the Small Academy of Sciences of Ukraine. The organizing committee selected most interesting and practical innovative projects dealing with the economy. The contestants were divided into teams, each made up of the author of the project, a financier, and a marketologist. The first challenge was to quickly put together an effective team, considering that its members were total stranger. Business trainers, scholars, and market experts spent a week coaching the teenagers. Their main task was to teach them lean production [a systematic method for waste minimization – aka Muda – within a manufacturing system without sacrificing productivity – Ed.]. His team members are into music. Nazar plays the piano and composes electronic music. Mykola plays the ordinary and button accordion, and is learning to play the guitar. Yulia is attending a music school, majoring in the guitar. Nazar adds that the idea was conceived a long time ago, when he started thinking about the kind of music that would best reflect his sentiments and his attitude to what was happening around him. Then he shelved it – until there appeared music-composing programs. It was then he realized he had to keep working on his project, upgrading it, including his own audio or video track. Nazar says there are lots of similar programs and that all it takes is reconfiguring them a bit, unifying them, and producing the final neuro network model that will integrate all music and video characteristics, ending up in harmony. Probably the biggest project would be one with a database with top commercials, music, and characteristics analysis. Nazar wants freelancers and teenagers for his project. Anatolii KHRAMCHENKO, Shostka, Sumy oblast, demonstrates a WI rotor wind turbine model. It can be used on modern highways. The way it works is simple: the speeding cars create a wind stream, the generator rotates, and the mechanical energy is converted into electricity. Anatolii proposed a generator made of vinyl plastics, but after the launch and after hearing experts say that it would be a long time before his device paid off, he will most likely look for other options. A total of 32 teams of high school students are expected to be handled by UF Incubator on Chokolivskyi Blvd. this year.